It was no ordinary smuggling bust. On Dec. 11, an old Russian plane landed in Thailand to refuel after taking off hours earlier from Pyongyang, North Korea. In its hull, police found 35 tons of explosives, rocket-propelled grenades and components for surface-to-air missiles, all being transported from North Korea in breach of U.N. sanctions. The captain and his crew were promptly arrested and charged with illegally transporting arms. But according to experts, they were only tiny cogs in a global network for arms trafficking that feeds off the castaway pilots and planes of the former Soviet Union. Suspected smugglers like Russian Viktor Bout have used the system to transport weapons, as have huge U.S. military contractors like Kellogg, Brown and Root (KBR), though not for illegal purposes. And while the flight crews like the one stopped in Thailand face the prospect of long prison terms, the people behind this global arms-shipping service remain hidden in the shadows. The chief engineer on the flight was Mikhail Petukhov, 54, an out-of-work Belarusian with nearly two decades of experience in the Soviet air force. His wife Vera told TIME by phone from Belarus that the flight was Petukhov's first for a company whose name he never told her. Before that, he had waited more than six months for a job. "That's how it always is," she says. "Only once in a while by chance they'll get a call about some one-off job. And they take what they can get. Once he was gone for three months and came back with only $50; other times it's more. Then he waits around again." She said he had never the other crew members, all Kazakhs, before he left in early December for Kiev, where the flight is believed to have originated. Most of the time, the coordinators of these flights are fly-by-night companies set up to ship goods in violation of U.N. weapons sanctions or embargoes, says Hugh Griffiths, an expert on illegal arms trafficking at the Stockholm International Peace Research Institute. Analysts have said the weapons on board the flight from Pyongyang were probably meant for terrorist groups or rebels in the Middle East or Africa, the usual clients for these types of portable but high-impact arms. But authorities have thus far been unable to establish who arranged the shipment  the paper trails are too winding and the companies involved too murky. However, there are clear connections between the seized plane and smuggling networks in Russia and Eastern Europe. Griffiths says the plane was previously registered to a company that has links to self-professed Serbian gunrunner Tomislav Damnjanovic and to three companies controlled by Bout, who has been dubbed the "Merchant of Death" by Russian media. Last year, Bout was arrested in Bangkok after allegedly offering to sell weapons to U.S. Drug Enforcement Agency officers posing as members of the Colombian rebel group FARC. 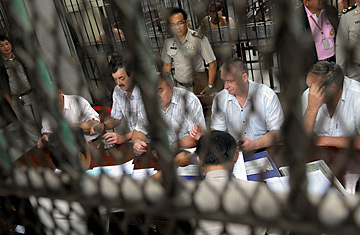 While the U.S. seeks his extradition, Bout is being held at Klong Prem prison in Thailand, the same place where Petukhov and his crew are now jailed. Damnjanovic has been accused of setting up other hauls like this one. According to a report published in 2007 by a U.N. Development Program (UNDP) research institute in Serbia, a company owned by Damnjanovic smuggled military equipment in 1996 to the regime of Colonel Muammar Gaddafi in Libya, which was then under U.N. sanctions. During one of the shipments, the pilot of an aircraft noticed problems with the plane's electrical systems. Damnjanovic insisted that the flight go ahead anyway, the U.N. report alleges, and offered the crew $2,000 extra apiece. Fifteen minutes after takeoff, the plane crashed near Belgrade and killed everyone on board, the report says. "[The pilot and crew], they are victims of circumstance. They are often paid extra money to accept a flight, often using planes that they know are not entirely safe. But they are so desperate for the money that they agree to take the flight," Griffiths says. Repeated efforts to contact Damnjanovic, believed to be living in the United Arab Emirates, were unsuccessful. In a 2007 interview with the New York Times, he denied any involvement in illegal dealings and defended his involvement in arms shipments to places like Rwanda, calling his business "completely official." He said, "What somebody else does with the weapons when they get there is up to them." Complicating matters is the fact that Damnjanovic has ties to U.S. defense contractors like KBR and General Dynamics, according to the same UNDP report. Both companies have hired Damnjanovic's companies in the past to ship equipment on behalf of the U.S. military. "The case study of the career of Tomislav Damnjanovic illustrates how smart arms smugglers work within and outside the law, trafficking to rogue states and African dictatorships under U.N. sanctions while at the same time supplying arms on behalf of some of America's biggest companies, such as General Dynamics and Kellogg, Brown and Root," the UNDP report states. In a statement to TIME, Heather Browne, KBR's head of communications, said the company had no knowledge that the allegations in the UNDP report were true. "KBR is committed to providing high-quality service to our customer, the U.S. military, and conducting our business with ethics and integrity. The company in no way condones or tolerates anything to the contrary," the statement read. Rob Doolittle, a spokesman for General Dynamics, declined to comment on the report. For out-of-work pilots in Eastern Europe, a job is a job no matter who is paying the bill. Vladimir Migol, a retired aircraft engineer who served with Petukhov in the Soviet air force in the 1980s, says that for many pilots, flying for these shadowy companies is the only type of work they can get. "Everybody knows that these planes sometimes get busted with stuff, or they crash," says Migol. "But you still have to fly. We all have families to feed, and the chips fall where they fall." See more about global crime in "The New Gangsterism." See pictures of Person of the Year 2009 runner-up General Stanley McChrystal. See the Year in Pictures 2009.